1. DESCRIPTION: CYT11 ASK wireless transmitting module is using the surface acoustic wave resonator and high power RF circuit. This circuit will have current consumption only if you press the button which means there is no electricity consumption at ordinary times. It is simple to use. 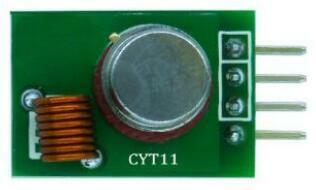 CYT11 can cooperate with the commonly used ASK super-regenerative receiver circuit or super heterodyne receiver circuit. 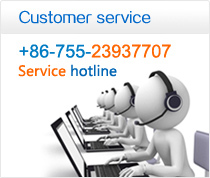 CYT11 is with high frequency stability. The data port can direct access to the data signals of the single chip microcomputer or wireless encoding chip and it can easily achieve the function from data to the wireless signal emission which will be easier to develop and produce wireless products. High output power, transmitting Power > 30mW. There is no current consumption when there is no data transmitting. The current consumption with low emission is 30mA(5V).